Anatomy and Histology of the Laboratory Rat in Toxicology and Biomedical Research presents the detailed systematic anatomy of the rat, with a focus on toxicological needs. 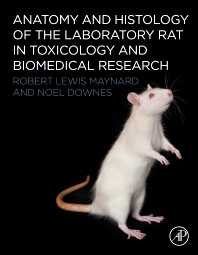 Most large works dealing with the laboratory rat provide a chapter on anatomy, but fall far short of the detailed account in this book which also focuses on the needs of toxicologists and others who use the rat as a laboratory animal. The book includes detailed guides on dissection methods and the location of specific tissues in specific organ systems. Crucially, the book includes classic illustrations from Miss H. G. Q. Rowett, along with new color photo-micrographs. Written by two of the top authors in their fields, this book can be used as a reference guide and teaching aid for students and researchers in toxicology. In addition, veterinary/medical students, researchers who utilize animals in biomedical research, and researchers in zoology, comparative anatomy, physiology and pharmacology will find this book to be a great resource.